Stanford scientists may have solved the mystery of what drives a type of earthquake that occurs deep within the Earth and accounts for one in four quakes worldwide. Known as intermediate-depth earthquakes, these temblors originate farther down inside the Earth than shallow earthquakes, which take place in the uppermost layer of the Earth’s surface, called the crust. The kinds of quakes that afflict California and most other places in the world are shallow earthquakes. But about once a month one occurs that is magnitude 5 or greater – strong enough to be felt by the city’s residents. Moreover, past studies have revealed that most of the quakes appear to be concentrated at a site located about 90 miles beneath the Earth’s surface that scientists call the Bucaramanga Nest. This type of clustering is highly unusual and makes the Bucaramanga Nest a “natural laboratory” for studying intermediate depth earthquakes. Comparison studies of intermediate quakes from different parts of the world are difficult because the makeup of the Earth’s crust and mantle can vary widely by location. 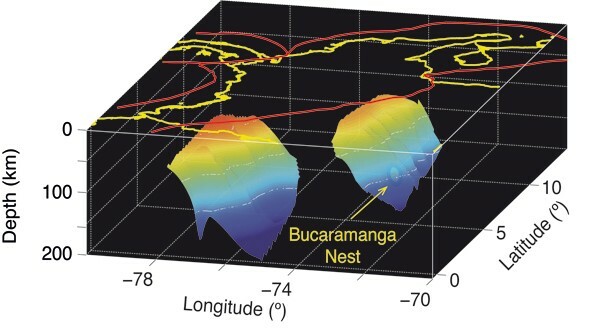 By studying seismic waves picked up by digital seismometers installed on the Earth’s surface above the Bucaramanga Nest, the scientists were able to measure two key parameters of the intermediate quakes happening deep underground. One, called the stress drop, allowed the team to estimate the total amount of energy released during the fault slips that caused the earthquakes. The other was radiated energy, which is a measure of how much of the energy generated by the fault slip is actually converted to seismic waves that propagate through the Earth to shake the surface.